Having a better understanding of people—their brains, cultures, traditions, beliefs, stories—helps you to develop superior communication skills and the ability to understand and appreciate diverse points of view. Anthropology is a multi-disciplinary approach to studying, researching, and engaging with the human experience. Whether you're taking only one class or purusing a major in our department, you'll have a diverse set of opportunities to engage with faculty members to enhance your education. Our faculty lead Study Abroad programs in the Himalayas, the South Pacific, and Ecuador. Undergraduates also have the chance to work with faculty members in the field, conducting artifact analysis. But there are also plenty of ways to work closely with professors without ever leaving campus, such as conducting research in one of our many labs. 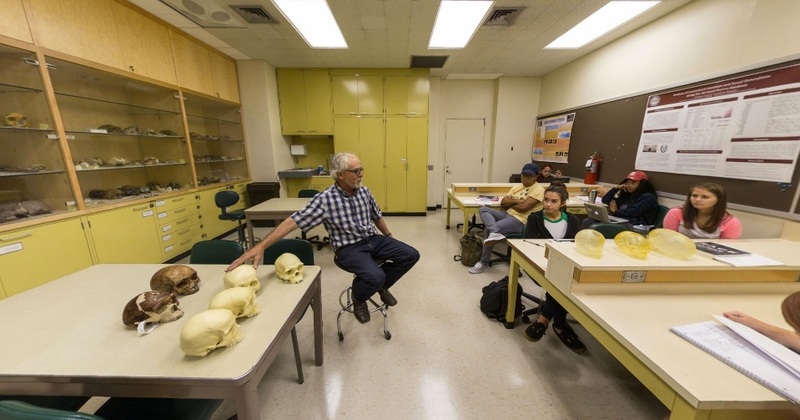 If you're considering a major in anthropology, know that we are committed to the success of all of our students. Our Director of Undergraduate Studies and our Academic Advisor are here to introduce students to the major, connect current students to faculty with shared interests and coordinate with our two student organizations to provide events and programming to support our majors academic and professional growth. Each undergraduate major is assigned to a faculty member who serves as their advisor and mentor for their undergraduate tenure. Most of our undergraduate classes are under 50 students allowing for significant faculty-student interaction. All of our majors are required to enroll in a senior seminar course which is less than 25 students. In these seminars students are able to build strong personal connections with faculty and engage in dialogue with their classmates on major Anthropological questions. Both our large and small classes encourage undergraduate students to engage directly with faculty and their peers in discussion. "Professor Alter understands that not all learning is done with a textbook or in a classroom. In his Pitt in the Himalayas Study Abroad program, we learned about Garwhal India through submersion, the assigned reading supplementing our first-hand experience. Professor Alter asked us to construct essays based on our observations. He forced us to think critically about the culture. He knew exactly how to expose us to different facets of the culture and stimulate our ideas. India was a life-changing experience for me. Professor Alter’s tutelage showed me how to incorporate anthropology into my own interests and life." We have two student organizations, one of which is an honors organization, that hold regular meetings and events throughout the academic year. These events range in topics from guest faculty discussions on research, graduation school planning and preparation, study abroad and internship night to fun and casual events to build community amongst the undergraduate majors. The honors organization also sponsors a research symposium in the fall semester to showcase the on-going work of undergraduate students. Both the student organizations and faculty lead off-campus trips to conferences, research sites, museums, and archaeological sites.